Dominic Power provided a version of this classic eighteenth century comedy, the changes including his own Prologue and Epilogue. The efforts of the moralising hypocrite schemer Joseph Surface (Paapa Essiedu), in league with Lady Sneerwell (Julia Hills), to undo for their own ends his wild but generous brother Charles (Jack Wharrier) are complemented by the frustrations of the elderly and irascible Sir Peter Teazle (Christopher Bianchi) trying to cope with his young wife, Lady Teazle (Daisy Whalley). The college of scandalmongers is led brilliantly by Byron Mondahl’s Sir Benjamin Backbite. There is of course a happy end when wealthy uncle Sir Oliver (Chris Garner) pops up to reveal the true respective natures of his nephews in a series of hilarious exposure scenes. 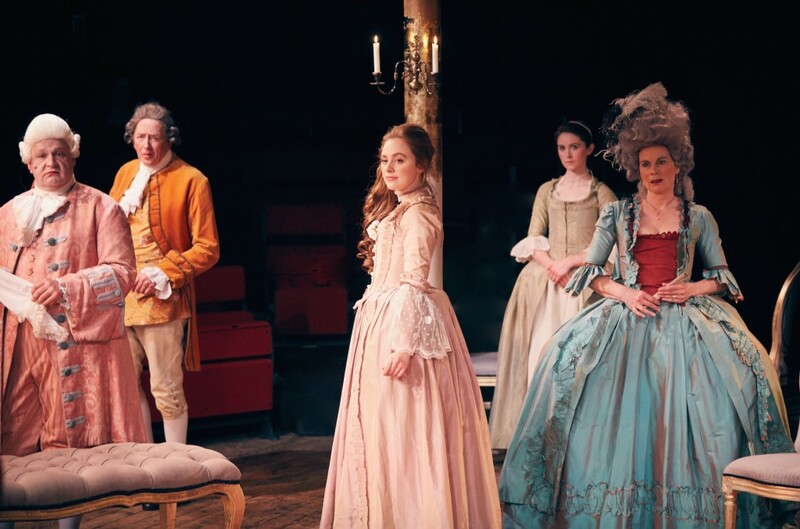 Hilton and Designer Emma Bailey overcome the difficulties of producing a play clearly designed for the 18th century stage in the Tobacco Factory’s in-the-round space with inventive ease. Andrew Hilton’s immensely enjoyable Shakespeare at the Tobacco Factory production of the Sheridan classic opens with a display of hilarious brio from Byron Mondahl, who steps into the intimate arena of this South Bristol venue, only half in character as he has not yet donned his powdered wig, to deliver a quick fire introduction on the joys of gossip. He is wearing salmon pink brocade and breeches and suddenly whips out a red mobile to catch up with the latest tweets, and shoots a selfie of himself in front of the audience. This stunning and energising piece of anachronistic warm-up sets the tone for three hours plus of perfectly-pitched satire, played by an ensemble of actors who never put a foot wrong. 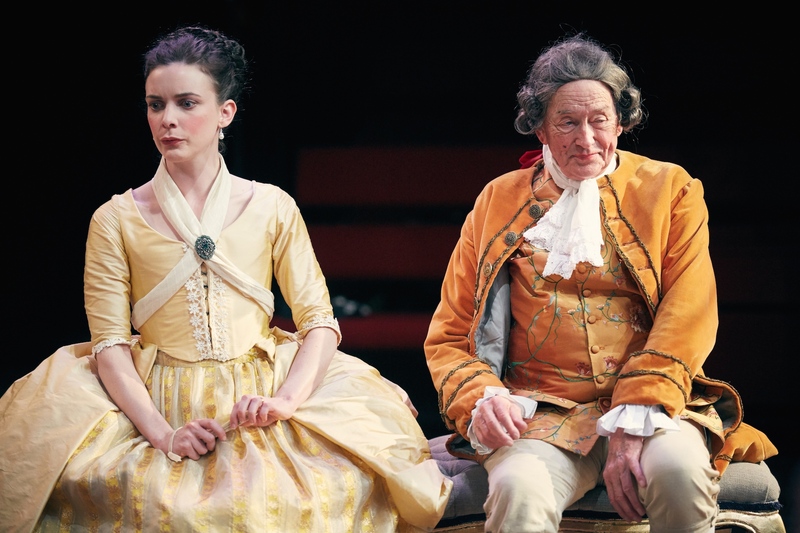 The appearance of the phone is a neat reminder that the lust for scandal which drives the play’s plot is a perennial human appetite, not just an 18th century foible. Hilton’s strength has always been in making the most of his texts – whether the staple Shakespeare that has established his national reputation as an outstanding director, or when he has done Chekov or Stoppard. He captures the brilliance of Sheridan without overdoing it: the Irish-born playwright had a rare gift for dialogue and plot, and presenting this on stage requires the lightest of touch rather than an excess of comic display. 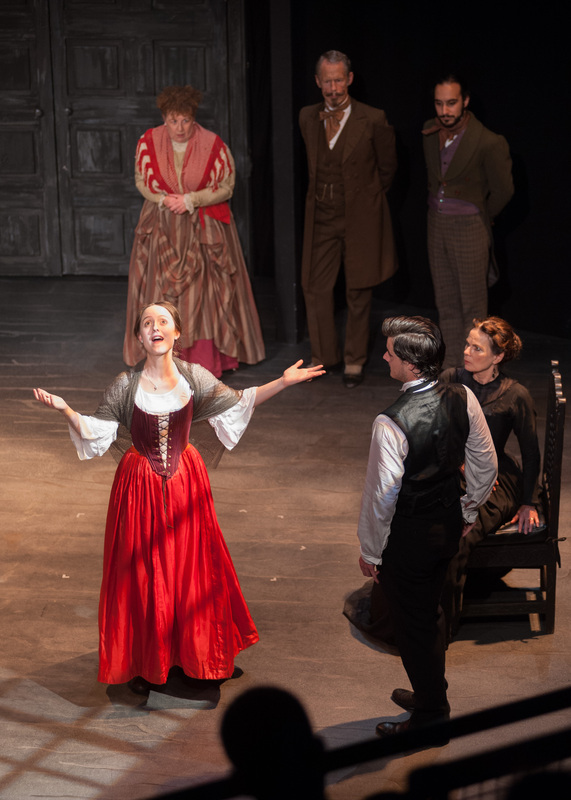 Hilton allows us to enjoy the play’s skillful structure, both in the pacing within scenes and the almost musical way in which the plot twists and turns, and increasingly farcical situations lead us joyously to the play’s conclusion. 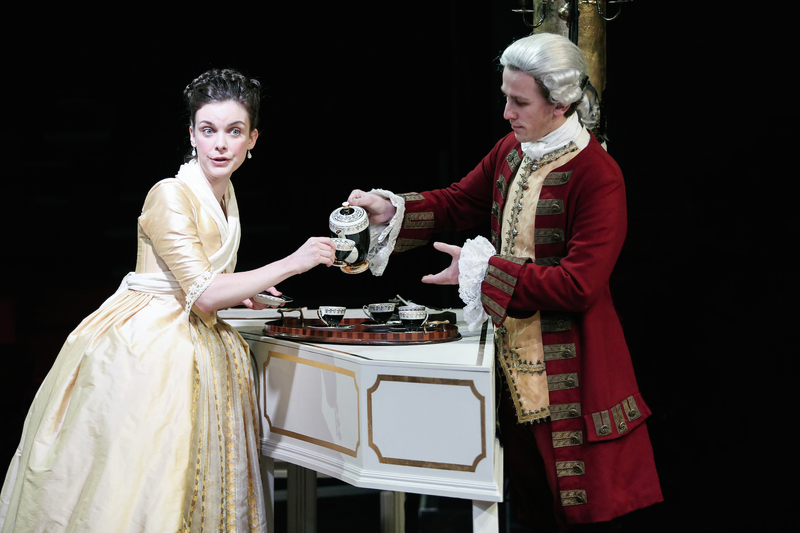 The production strikes a delicate balance between the hard edge of satirical caricature and the empathy that comes from human frailty … The perverse pleasure in scandal comes in a range of shades: Fiona Sheehan (Mrs Candour) manically pours out her titbits and Byron Mondahl mixes camp, guile and child-like innocence in a tour-de-force act as Sir Benjamin Backbite. Their sharp tongues, as with the other gossips and schemers, mask a more deep-seated vulnerability. Only Snake – played with sinuous and reptilian panache by Paul Currier – has the strength of his entirely malevolent convictions: the rest are subject to the hypocrisy which defines a society in which appearances matter more than true personal worth. 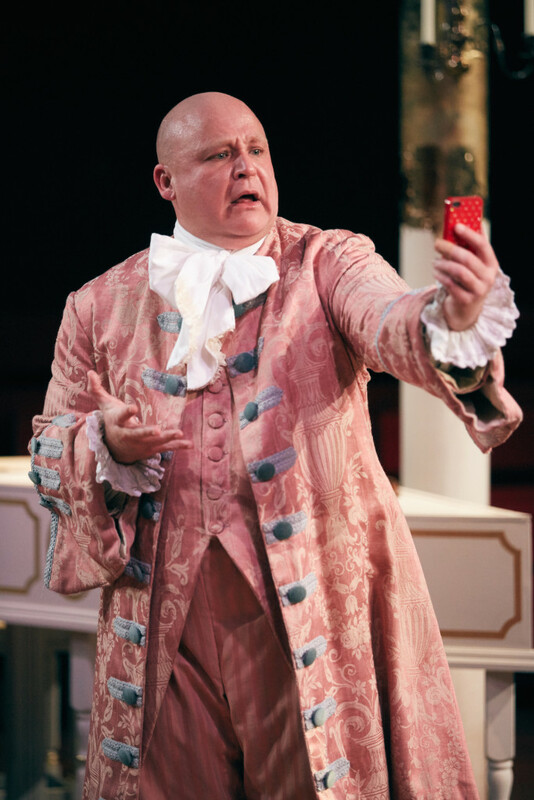 Chris Bianchi (Sir Peter Teazle) catches the ageing husband’s pathos well and his sparring with a much younger wife – played with a mixture of cunning and coyness by Daisy Whalley – catches all the archetypal nuances of marital strife. Jack Wharrier is a very genial Charles Surface, the ‘libertine’ with a generous heart – a man who prefers the pleasure of partying and gambling to the more perverse thrill of enjoying the misfortunes of others. A stark contrast with his duplicitous brother Joseph, played with a mixture of charm, venom and insecurity by Pappa Essiedu. So much of the strength – and sheer pleasure – of this production comes from the playing between the actors, all of whom inhabit their respective characters with total assurance and yet resist the temptation to overshadow the others around them, even when the text puts them in the spotlight. There is tangible enjoyment in the acting – and as in the very best of Andrew Hilton’s productions – a vitality that creates a positive feedback loop within an enclosed space that magnifies energy and emotion. There is something approaching real magic here: at the heart of the thrilling experience of first-class comedy, we can savour the intense pleasure of the communal ritual that makes theatre so potent a force in our lives. … In a world in which once respected newspapers profess themselves aghast that an aspirant Prime Minister should have had talented and attractive girlfriends before getting married, in the world of twitterstorms and Wonga, School for Scandal remains utterly modern. Andrew Hilton’s production, whilst being on the side of the angels, also has the wisdom to tell us that malign gossip exists because we like it. Sheridan’s wit is given full rein. The grotesques who surround Lady Sneerwell are vivid and malevolent, constantly passing on gossip, trashing with relish the reputations of even their closest friends. Julia Hills’ excellent Lady Sneerwell, though, doesn’t laugh when age is mocked, aware no doubt of what others will be saying about her behind her back; a reference to ‘disappointed widows’ hits home. The famous screen scene comes off beautifully: the in-the-round staging is used here to great effect, as it is (with the help of the audience) in the scene where Charles sells off the family canvas. The design by Emma Bailey trusts to our imaginations: a few chairs, a chaise longue, a harpsichord are all we require. As ever with this company there is not a weak link in the cast. I particularly enjoyed Christopher Bianchi’s Peter Teazle; credulous, foolish in his choice of a wife but aware that he has no one to blame but himself. He is well matched by Daisy Whalley’s Lady Teazle, an innocent country girl keen to discover all that is fashionable in London and able to give as good as she gets when in dispute with her husband. As she says, “If you wanted authority over me, you should have adopted me and not married me. I am sure you were old enough”. Paul Currier makes a suitably oleaginous Snake, a representative of the press who has “nothing but my infamy to live on”. Byron Mondahl starts and finishes the evening off in style with a prologue and epilogue wittily updated by associate director Dominic Power. 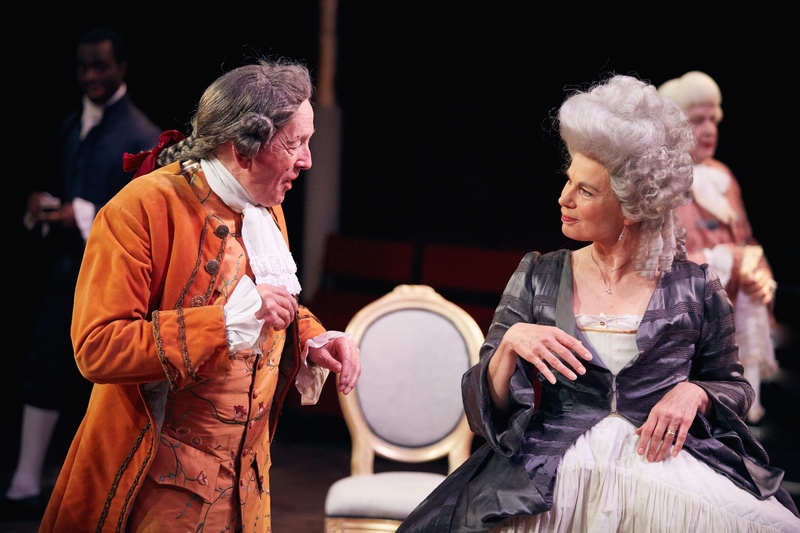 This first attempt at eighteenth century drama shows the company at its best: it is clear, funny, well acted and makes the author the star of the show. It enables the play’s contemporary relevance to emerge from the text; Hilton knows his audience can see contemporary parallels for themselves. Bitter rivalry between two contrasting brothers, amid a surfeit of double dealing and back-stabbing. 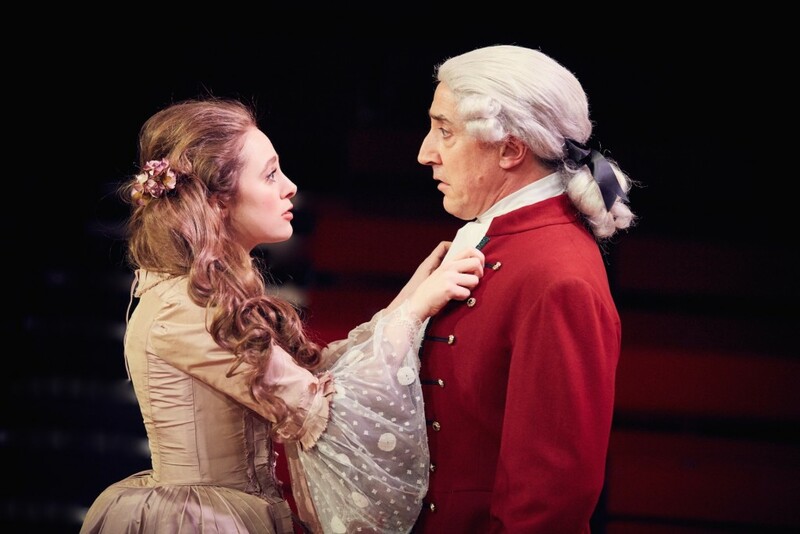 No, not the political backcloth to next month’s general election, but the plot of Richard Brinsley Sheridan’s great 18th century upper class caper … topped and tailed by a brilliant 21st century prologue and epilogue. Written in verse by associate director Dominic Power, and outrageously performed by Byron Mondahl, the two monologues muse on the arrival of the mobile phone and Twitter as the modern tools for disseminating gossip. They are the high points of a confident, but never over-exuberant production. Both senior citizens and bright young things display the best and worst of human nature. Christopher Bianchi retains admirable dignity as Sir Peter Teazle, whose spirited young wife is made suitably racy by Daisy Whalley in contrast to Hannah Lee as his demure ward Maria. The intricate love-and-legacy plot sees the Surface brothers – Jack Wharrier as the debonair Charles and Paapa Essiedu as the hypocritical Joseph – fall foul in turn of their rich uncle Sir Oliver (Chris Garner), while the rampant scandal-mongering is shared between the sexes. The early elegance of Julia Hills as Lady Sneerwell quickly comes to grief, Fiona Sheehan is an atrocious eavesdropper as Mrs Candour, and the aforementioned Mondahl (Sir Benjamin Backbite) and Benjamin Whitrow (Crabtree) are, if anything, even more adept at society tittle-tattle. Under the impeccable direction of Andrew Hilton, Shakespeare at the Tobacco Factory is serving up a perfect confection of celebrity gossip and slanderous innuendo. How unchanged we are! While Sheridan wrote of the mischievous chatter of 18th century London filling the columns of the broadsheet newspapers of the time, today we are at the mercy of a phone hacking culture and a twitterati hungry for tittle-tattle. Hilton has built an amusing bridge between the two. I’d challenge anyone to find a better rendering of Sheridan’s wonderfully witty exposé of deceit and defamation than this one. Every player owned his or her part – and all produced sharp and always tremendously funny performances. The Tobacco Factory space works so well for pieces like this – whispers can be heard, a raised eyebrow noticed and a glum face can fill the room. Scandal gets off to a wonderful gallop. In Lady Sneerwell (Julia Hills) and the odious Snake (Paul Currier) we have a couple of knaves driven by lust and money. Sneerwell in particular seeks to benefit from the deception she can weave into a world where rumour has the potential to ruin. Drawn into this malevolent world is the sizzling Mrs Candour (Fiona Sheehan) seeking juicy tidbits of chat like a seagull eyeing a sandwich in the hands of an unsuspecting tourist. Sneerwell, Candour and the effervescent Sir Benjamin Backbite (Byron Mondahl) form the backbone of what is in effect a celebrity gossip club. Later they will try to outdo each other when poor Sir Peter Teazle (Christopher Bianchi) becomes a victim to their inventions. Sir Peter’s young spoilt wife, Lady Teazle (Daisy Whalley), levered into higher society by marriage, has been starting to cut her teeth with this roguish band, but soon falls prey to it. The play centres upon two brothers, Charles and Joseph Surface (Jack Warrier and Paapa Essiedu). 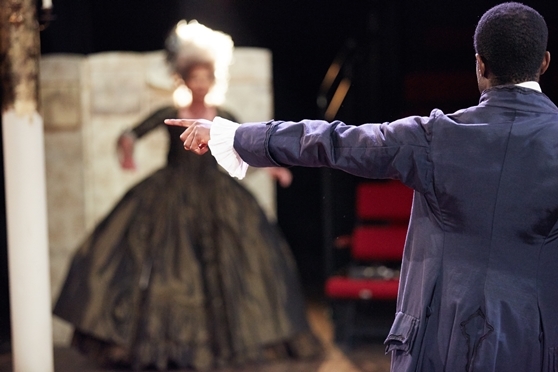 Sir Peter Teazle has acted as ‘a kind of a guardian’ to them both since their father’s sudden death. Both brothers have received generous endowments from an uncle who lives abroad. While Charles has been frittering away his fortune with revelry and gambling, his elder brother Joseph has been slyly building a reputation for being a man of sentiment, while secretly lusting after Sir Peter’s wife, Lady Teazle, and planning to marry Sir Peter’s ward, the demure Maria (Hannah Lee). The fun starts in earnest once the brothers’ benevolent uncle, Sir Oliver Surface returns suddenly. Constructing disguises for himself so he can test the brothers suitability for inheritance, there follows a delightful farce of mistaken identity, and an ever-present threat of disgrace and ridicule, before love has its day, and reason is finally untangled. This is the Shakespeare at the Tobacco Factory in top form, don’t miss it. Tittle-tattle a la mode: Sheridans’s classic is given a modern twist in Andrew Hilton’s pitch-perfect production. Few artistic directors have so steady a purpose as Andrew Hilton. He has made his central concerns – beady attention to text, hyper-clarity of acting – into a house style at the Tobacco Factory. No clutter, no stars. Now he takes on Sheridan’s The School for Scandal: full of stuff and celebrity-obsessed. It is beautifully recreated, but at a slight distance, rather than, as in the brilliant best of Hilton’s productions, tapping directly into the arteries of the play. Few works seem simultaneously so up-to-date and so long ago. What could be more 1777 than the folderol: the giant wigs, the pannier skirts, the gasping announcement of a piece of wit? What could be more 2015 than the adoration of celeb glitter, the confident parade of malice, the rapid circulation of tittle-tattle, and the sugary delivery of a particularly disagreeable snippet? A prologue and epilogue in which a powdered macaroni tweets and does a selfie with the audience gives a 21st-century twist to the backbiting. Both are ingenious but would have been better delivered in seconds not minutes. The body of the play is exquisitely in period: the iron pillars of the Tobacco Factory are half gilded; the costumes are pastel; each speech is delivered with crystalline clarity, though perfectly punctuated with the gasps and oeillades of affected emphasis. Hilton’s achievement is to find tender places among the prattling and battling. In one marvellous episode the ingenue, who is for the most part merely insipid, sings, alone in a warm circle of light. She is surrounded by darkness but free from the beehive buzz of malice. The moment brilliantly suggests an alternative morality, and the satisfactions of a private life. In that least private but often most intimate of places, a theatre. … Not for this company any comedy of mannerisms, with fluttering fans and eyelashes, or simpering smiles trying to manufacture humour. The manner of the 18th-centutry is there, but each character is freshly thought-through. There’s pain behind Julia Hills’ malicious Lady Sneerwell, a vacuum of self-awareness around Fiona Sheehan’s Mrs Candour. And when, as would happen a century later in Oscar Wilde’s social comedies, the bon mot characters filter away, there’s a reality to the figures playing-out the central moral comedy. Paapa Essiedu doesn’t strive for the big comedy impact as Joseph Surface, containing the character’s insincerity within a quiet circumference that’s all the more calculating in its pretended probity. The production leaves Jack Wharrier’s Charles Surface to provide cheerful generosity in an open manner expressing his guileless good nature. As the teachers and scholars of scandal reveal the tart taste beneath society’s sugared surfaces, there’s eventual reconciliation for the other central pair, the Teazles. Daisy Whalley’s young Lady Teazle expels herself from the scandal school after the severe shock of being exposed, while Christopher Bianchi, whose steady pace throughout has shown him discomfited with the ways of the world his wife inhabits, finds room for a new wisdom and reflection upon the risks of marrying a vivacious young woman. Richard Brinsley Sheridan was born in Dublin in 1751 of literary and theatrical parents. His father, Thomas, a godson of Jonathan Swift, was a leading Irish actor – dubbed the ‘Irish Garrick’ – and also the manager of the Smock Alley, Dublin’s royal patent theatre. His mother, Frances Chamberlaine, had been forbidden to learn to read by her strict clergyman father, but her brothers had taught her so successfully that she became a celebrated writer, encouraged by the novelist Samuel Richardson and admired by Dr Johnson and James Boswell. After the success of her novel The Memoirs of Sidney Biddulph in 1761 she also turned playwright, her dramatic work strongly influencing Richard’s own; this would include her creation of the character of Mrs Tryfort, a pretentious mangler of the English language, whom Richard would transform into the famous Mrs Malaprop in his first play, The Rivals. Richard’s younger sister Alicia, two years his junior, would also turn playwright, enjoying one hit in London in 1812 with Prejudice, or Modern Sentiment. The family moved to London in 1758 after their fortunes had been severely hit by the near-destruction of the Smock Alley Theatre during a political riot. Richard, who remained briefly at school in Dublin was then seven and Alicia five. Their father soon forsook the theatre, though not before co-starring with David Garrick in their mother’s hit comedy, The Discovery, at Drury Lane. (Garrick declared it the best comedy of the age.) Thomas developed instead a passion for education, moving the family again, from London to Bath, where he wrote a number of books on the subject of the standardization of the English language, and on elocution, which he passionately believed could raise the moral tone as well as the elegance of discourse of the whole nation. In Bath Richard got to know Elizabeth Ann Linley, the young daughter of the composer Thomas Linley and his wife Mary Johnson. Elizabeth was already a celebrated singer and beauty (she had appeared at Covent Garden from the age of 12, and Gainsborough was to paint her at least four times) and it was her earnings that eventually allowed the family to move to London. But in 1772, when Richard was twenty and Elizabeth seventeen, Sheridan escorted her from Bath to France, to help her escape the unwanted attentions of a married man, Captain Thomas Mathews. The aggrieved Mathews ‘posted’ Sheridan in the Bath Chronicle, calling him “a L- and an S-“ (a liar and a scoundrel). Sheridan returned to England to fight a duel with Mathews, as gentlemanly convention demanded. In the first bout (they fought with swords) neither man came to any harm, but Sheridan claimed victory and broadcast his contention that Matthews had begged for his life and signed a retraction of the libel. Matthews was furious and challenged Sheridan to a second round. This was a bloodier affair in which Sheridan came off worse and only narrowly escaped with his life. At some time during these events Richard and Elizabeth had fallen in love. Whether their journey to France had in fact been an elopement and involved a secret betrothal, or even marriage, is disputed, but in 1773 in Marylebone Church they were formally married (with her father’s blessing, but not Thomas Sheridan’s) and in the following year took a house in nearby Orchard Street, at first entirely dependent on Elizabeth’s dowry and income. Richard soon began writing for the stage, and in 1775 his first play, The Rivals, was produced at London’s Covent Garden, one of London’s two royal patent theatres (Drury Lane being the other). The first night, on January 17th, was something of a disaster. The actor playing Sir Anthony Absolute had few of his lines to heart and resorted to crude bluster and comedy to fill the void (most theatre at this time was horribly under-rehearsed); and the part of Sir Lucius O’Trigger brought censure on both the actor, John Lee, for being unable to master an Irish accent, and on Sheridan himself for what the Morning Post described as “so villainous a portrait of an Irish Gentleman [that was] permitted so openly to insult that country upon the boards of an English theatre”. O’Trigger was quickly recast and the second performance was a huge success, immediately establishing Sheridan as a leading figure in the theatre and a new celebrity in London’s febrile fashionable world. The Rivals was followed rapidly by the opera, The Duenna, Sheridan going into partnership for this with his composer-father-in-law. It was another great success and played for seventy-five performances. This partnership with Linley then continued into theatre management; in 1776, together with a Court physician, Dr James Ford, they bought a half interest in the Drury Lane theatre from David Garrick, who was now approaching the end of an illustrious career. In his first season as Manager at Drury Lane, Sheridan revived three plays by Congreve, including his most celebrated, The Way of the World. This was a bold, but successful move. Much of Restoration comedy had fallen from grace since the early years of the century, coming to be considered immoral, even ‘licentious and pernicious’ (the extraordinary licentiousness of real life at the time had this peculiar corollary in a new public prudery and taste for moral sentiment in fiction) but the public responded well, welcoming Congreve back to the stage for a brief second honeymoon. 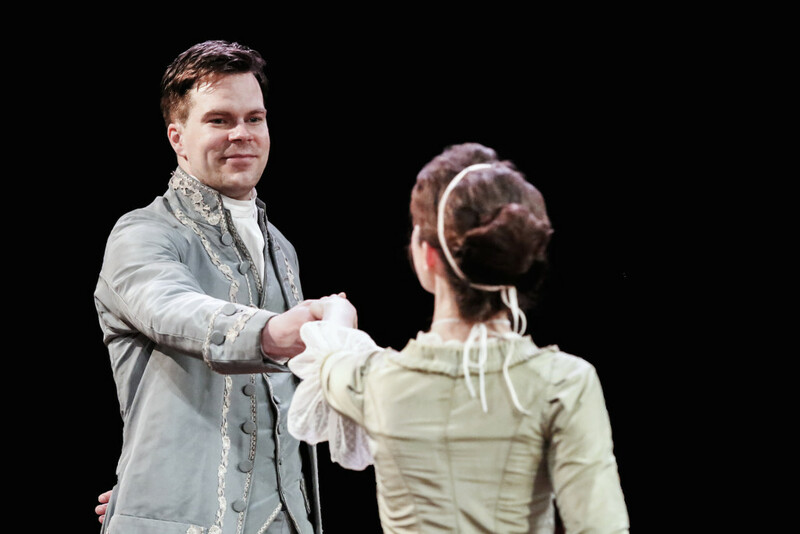 Congreve was the perfect preparation for Sheridan’s third creation, The School for Scandal, which he premiered on the 8th May 1777. In the characters of Sneerwell, Joseph Surface, Backbite, Candour and Crabtree he invites us to relish as well as be appalled by maliciousness, duplicity and scandal, while at the same time mocking Sir Peter Teazle’s modern veneration of ‘sentiment’ in the person of his ‘friend Joseph’. He followed it with The Critic (1779), an updating of the satirical Restoration play, The Rehearsal, by George Villiers and others, in which Sheridan parodied the work of the leading ‘sentimental’ dramatist of the day, the now largely forgotten Richard Cumberland. For thirty-two years Sheridan was also a Whig Member of the British House of Commons; for Stafford from 1780–1806, for Westminster from 1806–1807 and for Ilchester from 1807–1812. He entered the House as the ally of Charles James Fox on the side of the American Colonials, though his first speech had to be a defence against the charge of bribery – he had been accused of buying votes at five guineas apiece. In 1787, supporting Edmund Burke, he demanded the impeachment of Warren Hastings, the first Governor-General of India, on the grounds of corruption and mismanagement in Calcutta. His speech was described by Burke, Charles James Fox and William Pitt as the greatest ever delivered in ancient or modern times. He later moved into government itself, as Receiver-General of the Duchy of Cornwall (1804–1807) and Treasurer of the Navy (1806–1807). This disaster was compounded in 1812 when he lost his Ilchester parliamentary seat, provoking his creditors to pursue him into increasing impoverishment and decline. Getting wind of this, a grateful American Congress offered Sheridan £20,000 in recognition of his efforts to prevent the American War of Independence, but the offer was refused. In December 1815 he fell seriously ill and he died in poverty on 17th July 1816. He was buried in Poets’ Corner in Westminster Abbey. He had been twice married. His first marriage to Elizabeth, which brought them a son, Tom, eventually broke down; Elizabeth had a shortlived child by her lover, Lord Edward Fitzgerald, which Sheridan cared for after Elizabeth’s death at Hotwells in 1792. In 1795 Sheridan married Esther Jane, eldest daughter of Newton Ogle, the dean of Winchester. She bore him at least one child, Charles, and died in 1817. The novelist, Henry Fielding, described 18th century London as ‘a vast wood or forest, in which a thief may harbour with as great security as wild beasts do in the deserts of Africa or Arabia.’ It was certainly a dangerous city; on emerging from the theatre in Covent Garden you could be assailed by pickpockets armed with knives, pestered by feral children or assaulted by aristocratic hooligans on a drunken rampage; there were warrens of streets and narrow passages lined with ramshackle tenements where no moneyed person would dare to venture; prostitution was rife, with an estimated 5% of the female population engaged in it whole or part-time; and as for the exercise of law and order, while the rotational duties of the citizenry as Constables and Night Watchmen were being replaced by paid officials and fee-paid ‘thief-takers’ there was no stemming the rising tide of crime that accompanied the explosion in population. The city at this time has long been characterized by Hogarth’s uncompromising prints, ‘Beer Street’ and ‘Gin Lane’. Cheap and potent gin was indeed a major problem in the first half of the century, consuming half the country’s wheat harvest and taking a terrible toll on the poor, but by the time the Sheridan family took up residence the craze was over, leaving other factors to shorten lives – malnutrition (on average twenty people died of starvation every week), typhus, venereal diseases and back-breaking labour. It was a world of quite enormous differences in wealth and status. At the very bottom of the ladder were the ‘pure-finders’, wretched individuals who earned mere pence for collecting dog turds from the streets for use in the tanneries. Above them, domestic service was the largest employer (the Duke of Bedford employed a staff of 40 in his London house); in the middle of the century a live-in laundry maid might earn £5 or £6 a year and a footman perhaps £8. Meanwhile a labourer might earn £27 or £28 p.a., a tradesman £40, an army officer £50-£100, a London lawyer £200 and the wealthier merchants (many of them profiting from the African slave trade) up to £600. But the real wealth still belonged to the landed gentry. At a ball held by the Duke of Bolton in 1769 The Gentleman’s Magazine reported “it was said there were £270,000 worth of jewels between three ladies”. £270,000 in the mid eighteenth century might be equivalent to nearly £30 million now (the Office for National Statistics claim that a decimal penny in 1750 would have had greater purchasing power than £1 in 2003). Meanwhile the labourer’s £27 or £28 p.a. would be equivalent to perhaps £3,000, but even then would have purchased only about thirty pairs of that most perishable commodity, silk stockings, for a fashionable gentlemen. The laundry-maid could have spent her whole annual income on a mere handful of the flowers that The School for Scandal’s Lady Teazle is filling her dressing-room with in the second scene of the play (flowers in winter in Covent Garden sold for a guinea or more a bloom). It was also an ugly and cruel world. It is thought that in 1759 up to 3% of the UK population languished hopelessly in debtors’ prisons, a quarter of them to die there of disease, starvation or despair. Poisoning by mercury, lead, plaster dust, arsenic and sulphur were accepted hazards of the working environment (even hairdressers suffered from lung disease caused by wig powder), and hundreds of young boys were employed as chimney-climbing sweeps, even being sent up them to put out fires. And while the greatest of all cruelties was being perpetrated out-of-sight-and-mind a world away in the American plantations, London still celebrated eight annual ‘hanging days’ – public holidays when London’s populace were invited to line the streets to see wretched felons being carted to Tyburn to be put to death, sometimes for the theft of as little as £2 worth of goods or coin. The constables had the use of squalid little ‘roundhouse’ prisons scattered about the city, where they could lock up trouble-makers overnight prior to taking them before the magistrates in the morning. One night in 1742 drunken constables crammed so many women – accused of disorderly conduct – into the St Martin’s Lane Roundhouse that by the morning six of them had been stifled to death. But it was also an immensely exciting city – the eighteenth century has been called London’s ‘golden age’ – and a magnet to incomers. Despite mortality exceeding the birth rate the city expanded from about 550,000 to a million during the course of the century, attracting people from across the British Isles and from Europe, making it by far the most populous city in the world. It was a centre of the European Enlightenment and temporary or permanent home to many internationally known scientists, writers, composers, philosophers, artists and actors. The two ‘royal patent‘ theatres – Covent Garden and Drury Lane – stood a matter of yards from each other in Covent Garden, an area that, by Sheridan’s time, had gone cheerfully down-market. Its central piazza had been laid out in the 1630s, bordered by grand and aristocratic dwellings. The great fire of 1666 had prompted a new influx of wealthy citizens deserting the old city; but a century later, with the growth of the fruit and flower market and the incursion of bagnios (bath-houses), bordellos and coffee houses the gentry moved yet further west, to Leicester Fields (now Leicester Square) and Soho’s Golden Square, and then further again to Grosvenor Square and beyond. Instead, Covent Garden became the hub of London’s creative life, home – in the words of one modern commentator – to the ‘first Bohemians’. Only these two theatres had the absolute right to present straight plays and they were consequently a focus of cultural life, as well as of the new cult of celebrity. The innumerable portraits of actors and playwrights by the leading painters of the time, are but one indicator of the immense popularity of their art. In his 1801 biography of David Garrick, Arthur Murphy claimed that “The Theatre engrossed the minds of men to such a degree … that there existed in England a fourth estate – King, Lords and Commons, and Drury Lane Playhouse.” In both theatres the actors were protected from assault by spiked railings across the front of the stage. But despite this, actors and audience shared a single space; with the auditorium almost as well lit as the stage, and the stage stretching far forward of the proscenium, writer and actor engaged in a dialogue with the audience. These were the last years of Shakespeare’s theatre, where the text rivalled the star actor for the honours. The time of the grotesquely oversized theatre, spectacular scenic effects and overblown romantic acting were about to diminish the writer for almost a century. In the mid eighteenth century London boasted more than a dozen newspapers, published either daily or tri-weekly with a joint circulation of 20,000 or more and greedily consumed in all the many coffee houses of Covent Garden and beyond. The most celebrated scandals would be followed as they evolved, with intense competition to be the first with each new development. It is said that in 1774-6 (when perhaps Sheridan was hatching The School for Scandal) the double scandal involving Samuel Foote and the Duchess of Kingston pushed even critical developments in the American War of Independence off the front pages. Samuel Foote (a name now unfamiliar to most theatregoers) was a leading character actor, playwright and manager of the Haymarket Theatre. He had first earned notoriety by making money from his own shock-horror account of the murder – in a naval ship anchored in Avonmouth – of his elder uncle, Sir John Goodere, by his younger uncle, Captain Samuel Goodere. Possibly homosexual, or bisexual, Foote continued to court notoriety throughout his career, but in 1775 began work on a play in which he mocked the Duchess of Kingston, Elizabeth Chudleigh, only thinly disguising her as ‘Lady Kitty Crocodile’. Chudleigh had herself courted celebrity by appearing at a masked ball in 1749 as Iphigenia, dressed in very little indeed (‘so naked ye High Priest might easily have inspected ye entrails of ye victim’). But now she was accused of bigamy, and she was tried – as was her right as both her husbands were peers of the realm – before the House of Lords in Westminster Hall. She was found guilty, but her status allowed her to escape the death penalty and she retired in disgrace to France. But her supporters, as an act of revenge for Foote’s scurrilous portrait, found a male servant of his who would testify that Foote had sexually assaulted him. Though Foote may also have been guilty as charged, he was found innocent; but the affair ruined his reputation which lapsed into the obscurity from which it has never emerged. Both stories, of course, were manna from heaven for the gutter press. Frances and Alicia Sheridan were not alone as female playwrights. By the end of the 18th century women could claim to author about 10% of all plays produced in London – much the same as it was at the end of the 20th. Theatre riots were relatively common. One of the most serious at Drury Lane in 1760 resulted from David Garrick hiring Swiss dancers and a French troupe of actors. Garrick’s audience assumed, to their outrage, that they were all Roman Catholics. Please click on the button below to view the adapted text on our Resources page.